Skunk2 One-Piece Forged Valves - Standard Compression - Dezod Motorsports Inc - Home of the automotive performance enthusiast since 2002. Made from lightweight EV8 stainless steel, one-piece forgings that are heat treated using a proprietary heat treatment process for exceptional strength and durability. Skunk2 One-Piece Forged Valves feature a special hardened tip which will not deform or gall when used with high-lift camshafts. Though many aftermarket valves look similar, Skunk2 forged valves feature specially designed valve head profiles to optimize airflow when used with stock or performance valve jobs. After CNC-machining and polishing, a black nitride coating is applied to reduce friction and increase wear resistance. Skunk2 Racing valves are available in stock and over sizes in both standard and high compression styles. Available as Kits or Individual Valves. 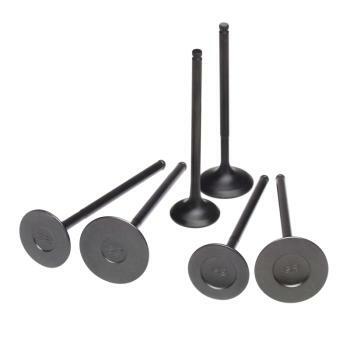 NOTE: Standard compression valves recommended as high quality, direct replacement part. 3-10g lighter than stock valves.